There are many people who believe that if they lack fear, they can easily become a tower climber. However, this is not true, and in order to become a tower climber you actually need an entire set of skills. There is no denying that those who fear heights won’t be able to become tower climbers, but it is also true that you will need to know how to work with electronic components, how to repair an antenna wire, and how to diagnose problems with malfunctioning equipment. As you can see, if you don’t know all this, you can climb the tower without having done anything useful. 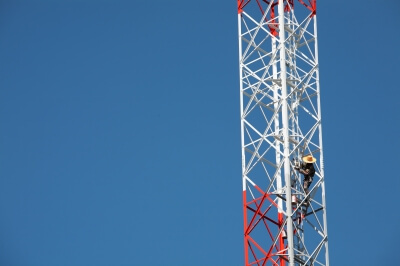 Since the number of wireless electronic devices are increasing in a considerable way, there are many more job openings for anyone who wants to become a tower climber. As you can imagine, a tower climber will need various skills, and besides knowing all the climbing techniques, he must also know all the safety procedures, which can include rescue methods. If you think that you can learn all this, then you can seriously think about becoming a certified tower climber. The first thing you will need to do is to complete an electronics course. Without this, there is no point of thinking about this kind of jobs. You need this course because the main reason you will be climbing a tower is to repair or install an electronic device. However, even if you know how to repair and install electronic devices, there is no use to think about becoming a tower climber if you don’t have the physical condition. There will be times when you will need to climb and descend a tower all day long. If you are not able to do this, you may be transferred to other department by your project manager. It may be difficult to become a tower climber, and therefore, if you want to impress the project manager, you will need to have an amazing post resume, being able to prove that you have excellent energetic knowledge combined with a great physical shape, being able to do this all day long without making any mistakes. This is a dangerous job, and therefore it is needed a rough preparation. This is the reason you will need some courses and an education, becoming a certified tower climber. Therefore, if you are seriously thinking about becoming a tower climber, you must definitely start a tower climbing course. In this way you will learn anything you need to know, being able to provide high quality services. Once you become a certified tower climber, you will have many job opportunities. Therefore, if you believe that you have what it takes to become a tower climber, then you should start looking for some courses that will provide you exactly what you need. This is not an easy job, but if you are passionate you will end up loving it. You can work with people who share the same passions.